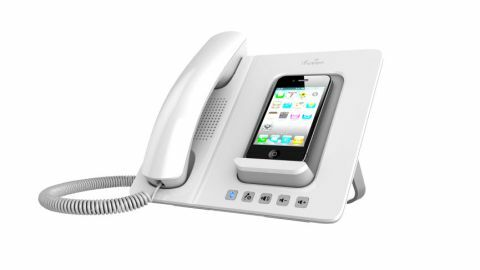 The Altigen iFusion AP300 SmartStation is intended to turn your iPhone into a fully functioning desktop phone that looks stylish and fun. The first thing you notice about the SmartStation is its size. It's actually quite large 200x224x56mm, so if you're working on a cramped desk then it may not be the best solution for you. Additionally the bright white plastic casing - there's a black version available - seems to make the SmartStation look twice as big as it actually is, and it dwarfs the iPhone when it's seated on the unit. But lets' ignore the styling issues and get down to the nitty-gritty. At the back of the device, hidden under a neat white removable panel are sockets for; the power supply (it powers the SmartStation and will recharge your iPhone), the handset connection, an 3.5mm audio out port to connect external speakers, and a micro USB for docking to a PC or Mac. On the front there are five control buttons, two to adjust the volume, a speaker button to switch to hands-free mode, a microphone mute button, and a Bluetooth connection button. Setting up is simple. Just plug in the power and then pair the phone and the device. To pair, switch on Bluetooth on the iPhone, press the Bluetooth button on the SmartStation and when the device appears on the iPhones' list of Bluetooth devices, select pairing and a second later it's paired and working. The external handset was well designed and felt comfortable in the hand and even when grasped under the chin - the handset is a must for those long calls. The handset sound quality was clear and seemed to be as good as, and probably a little louder than the iPhone. Once paired the iPhone and SmartStation work together. So when a call comes in the iPhone and the SmartStation both ring - the iPhone doesn't need to be on the dock for the SmartStation to ring just near enough for Bluetooth to connect. When a call comes in you have two options, you can choose to answer the call by touching the iPhone and the audio goes directly to the units' speaker, or you pick up the handset in which case it goes directly to the handset. Sound quality on hands-free mode was good, and at a pinch the SmartStation could be used as a replacement for a conference system. However the audio quality when playing from your iTunes library was very tinny, if you want to play music then a set of external speakers would be recommended. A nice touch was the auto mute for the external speakers on incoming calls, as the last thing you want' is to be listening to music and then to broadcast your incoming call to the rest of the office. Once a call has been accepted it's possible to switch a call between the iPhone and the device, although it's not that straightforward to do. If the iPhone is docked, you need to remove it from the cradle, tap the iPhone audio source button and then select iPhone. To switch to the SmartStation while the IPhone is undocked, you need to tap the IPhone audio source button and select iFusion. You can then dock the phone or leave it undocked. As well as just taking and making calls with the standard iPhone Phone app the iFusion will also work with Skype and FaceTime and most of the other major internet call services and is compatible with the iPhone 3G, 3GS, 4, and 4S. The SmartStation worked well, and did everything that was expected of it. The only minor nags were the internal speaker quality when playing music from your phone, and the Bluetooth connection LED is quite bright and can be quite distracting.